This is a post by Free Homeschool Deals contributor Cassie of 3Dinosaurs.com! Valentines is just around the corner and these Valentines Math Printables are something fun to add to your February learning. 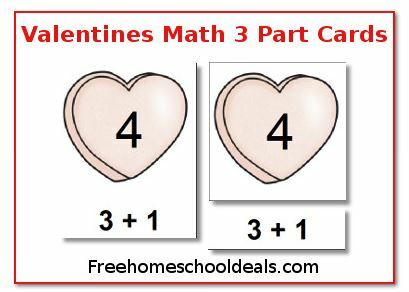 These themed Valentines Math printables cover addition, subtraction and a few other skills. 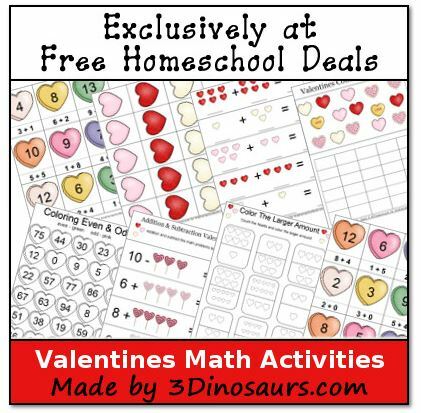 These Valentines Math Printables match up with the Valentines Pack on 3 Dinosaurs. Some of these pages are hands on as well as all in one worksheets. One fun new things is 3 Part Cards for learning some math problems. They are fun to use. It is something different to add to your learning. Here is how you match up the 3 part cards. I hope that you enjoy these Valentines printables as much as I do! If you are looking for other Valentines fun check out these fun ideas!